Read what experts, authors and executives say about The 7 Keys to Change. Follow me on Goodreads or on Amazon. 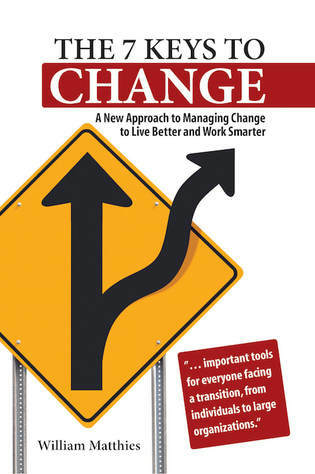 It's also a book managers can read to discover how to help themselves and their employees better manage change at work. As a planning consultant, I help companies create plans, plans that often require the company to make changes, a difficult task for many organizations. How effective was I? A few months after each planning assignment, I follow up with clients to check on their progress toward goals. Few clients accomplish anything close to 100% of their objectives with many achieving 50% or less. I became determined to figure out what really prevents a company from making the changes called for in their business plan. What should I be doing so that my clients might generate better results? My investigation included talking with many managers at private and public companies—from start-ups to large multinational companies—around the world. My focus was on business planning and change management, but my research soon expanded to include non-business self-improvement discussions, psychology, and sociology. Finally, I commissioned primary research with a representative sample of over 500 adults to understand their thoughts regarding change. After four years of research and study, my understanding of how companies change (or don't change) has increased dramatically, and my work with clients is the better for it. Every business—and every individual—needs to understand the tight interaction between planning and change management. The process is the same whether your company wants to open distribution centers overseas or you want to lose 25 pounds. Part I starts with a statistical look at how we all view change, followed by a discussion of the nature of change, the results of efforts to create positive business and personal change, and, finally, the reason learning how to better manage change is the single most important thing any of us can do. Part II spells out the seven keys you can follow to create more positive results from changes in at work and at home. Whether you are a manager, an employee, or both, or an individual who just wants live life more productively, The 7 Keys to Change will teach you what you need to do to achieve better results.